I remember those days. No one knowing, no one caring. My prison of stitches and soft, cuddly cloth surrounding me, never loosening, never letting me go free. I am a Starry Uni Plushie. Yes, you read that right. I am not a Plushie Uni, nor a Starry Uni. I am a Starry Uni Plushie, and this is my story. I sat on a tidy shelf, staring straight ahead with unblinking blue eyes. I could not turn to look at the plushies next to me, but I knew what they were. I saw them put down in the last restock, the same one I was set out in. They were a Red Mynci Plushie and a Blue Fuzzle. They sat there long before being bought, I am sure. They were lucky. 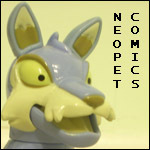 When they were bought, it must have been by a young Neopet, one who truly cared. They must have gone to a loving home to be played with every day. I am different. I am rare. I am wanted for collections, set out in the Trading Post, labeled with a hefty price tag. Within a few seconds, before the shopkeeper had even moved away from me, a paw was slammed down on my back. "I'll take this one!" the Faerie Kyrii announced. The Cybunny shopkeeper nodded, and my buyer carried me to the checkout desk. The two did not haggle; I was too precious for that. The shopkeeper simply offered a price, it was accepted, and I was carried out into the warm summer air. The Faerie Kyrii held me up and looked at me. "You'll make a nice addition to someone's collection," she told me. If I had been able to move, I would have shrugged. It was all the same to me. What did it matter where I ended up, if I couldn't enjoy my surroundings except by sight? The Kyrii walked out of the Plaza and into main Neopia Central--Central Central, I'd heard the plushie shopkeeper call it jokingly. She was heading for the Auction House, and I eyed the building curiously for as long as I was facing it. It was one of the first I'd seen, after all, besides being unusually shaped. The Faerie pet strode up to the double doors, pushed them open, and stepped inside. Inside, it was--how can I describe it? Chaotic doesn't do it justice. All I can say is that there are no words to describe the place; the noise, the constant jostle of the crowd... but back to the story. As I said, the Kyrii entered the Auction House. She fought her way through the crowd, heading for the desk at the back. I was nearly stolen at least five times, but the Kyrii had obviously been here before. She kept a firm grip on me and slapped any groping paws that reached for me. Finally, the Faerie Kyrii reached the desk, where a cheerful-looking Blue Shoyru was sitting. "How may I help you, madam?" he asked, eyeing me as if he knew the answer to his own question. "I'd like to auction this plushie off, please," was her reply. Judging by the answer, an even nod and a slight increase in the Shoyru's smile, she'd just proved him right. The Shoyru motioned for the Kyrii to sit down, which she did, keeping a tight hold on me. "What minimum bid?" he asked briskly. "Two hundred k," was the reply. I was too busy wondering what 'k' meant to catch the rest of the conversation, but they must have finished quickly, because in another minute I changed hands. The Shoyru carried me to a table and set a sheet of paper with a chart on it in front of me. He also set a plastic cover over me, 'to prevent thievery,' as he told the Faerie Kyrii. They both walked away, and I was left alone with only the other items for company. I don't think I've ever felt lonelier in my life than I felt then. I couldn't talk to myself, and even if I'd been able to, I had nothing to talk about. I couldn't think up a story, as I hadn't had enough experience in the world to develop my imagination. I couldn't even sleep, since my eyes could not shut. I was the gladdest Starry Uni, whether plushie or pet, in Neopia when someone finally bid on me. And then I had to wait again. Not for long, however, as another pet--a Red Quiggle--made his bid. Only a few minutes after they had left, the Shoyru took me away, along with the plastic cover and the paper. The Shoyru set me on a table in a private room, then looked over the paper, nodding every few seconds. After a while, he grabbed another sheet of paper from a box, scribbled something onto it, and put it in an envelope. He then wrote something on the outside of this, set it down, and snatched up a box from a pile. The Blue Shoyru approached me, picked me up, and set me inside the box. He fitted the lid on. If I had been able to move or speak, I would have cried out for him to give me some light, but as it was I had to bear it. I am horribly afraid of the dark, and it got worse steadily from that day onward. First, I think it was simply because I was young. After that, though, I imagined the stuffy inside of that box every time the lights went out. But I'm getting off track again. I heard the sound of tape being removed from its roll, so I suppose the envelope was attached to the top of the box. I was then carried a short way and dumped down. Scared and breathless (literally), I waited for something more to happen. I didn't have to wait long. I heard the fluttering of wings, as well as an earsplitting "WEEWOO!" and the box was lifted into the air. I was thrown from one side of the box to the other as the whatever-it-was carried me. After what seemed like days, I was dropped, and with a parting "WEEWOO!" the creature flew away. I heard the creak of a door being opened, and the box was lifted into the air yet again. To my immense relief, I was set down within a few seconds, and the box was opened. Two large Quiggle eyes stared in at me. It was the pet I'd seen at the Auction House! It took me a moment to get over my surprise. Before that moment was over, two small hands reached into the box and gently lifted me out. "You'll make the perfect addition to my collection," the Red Quiggle crooned, one of my memories surfaced, and I had to get over another surprise. The Faerie Kyrii had been right! Suddenly, a Spardel appeared from underneath a table. "No, Pheobe!" the Quiggle yelled, but it was too late--the Spardel jumped impossibly high in the air, grabbed me, and raced away. Pheobe ran out of the room, clutching me in her jaws, and dove beneath a table. I don't remember much about the few moments before the Quiggle rescued me. My mind has blocked them out, maybe. I know one thing, however: they were horrible. The Quiggle made a grab beneath the table. On his fourth try, he caught hold of the little Spardel and dragged her out. "Bad Pheobe!" he scolded, gently extracting me from the petpet's jaws. "Oh, Fyora, you're going to take some cleaning up..."
The cleaning up happened. I did not enjoy it; quite the opposite. Let's not dwell on that. After I was dry, the Quiggle carried me out of his house and to a nearby building. It looked very grand, and had a sign saying 'Plushie Place' in large letters. Descriptive, but not very creative. Well, the Quiggle carried me into the building. He took a set of keys out of his pocket, unlocked a glass-fronted cabinet, and set me inside next to several other plushies. After gazing fondly on his collection for a while, he left. And Plushie Place is where I find myself now, still sitting on the shelf where the Quiggle put me down. The building has been disused for a long time now, and dust is collecting everywhere. Everywhere, that is, except inside the glass cases. We are protected here from the aging of the outside world. My prison of stitches and soft, cuddly cloth surrounds me, never loosening, never letting me go free. And yet it is different from the beginning of my existence. I know where I am, I know that nothing is going to happen next. I know no one will disturb us, here inside this dusty, peaceful gallery. I stare unceasingly into the eyes of the Blue Draik Plushie sitting on the shelf across from me. I try to put a friendly look into my own eyes. And, even though nothing about the other plushie changes, I am sure he does the same.